DN : 65 ~ 300 mm. Air-Fow : 2.07 ~ 164 m3/hr. 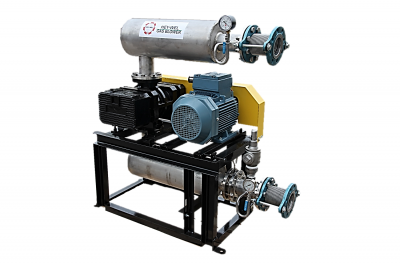 Features: Heavy duty rotary gas blowers equiped with Teflon coated three-lobe rotors, explosive-proof motor, high strength, rigid one piece casing with Teflon coating inside for protection against corrosion. Installed with Air/Gas seal & Oil seal to ensure un-leakage gas, oil lubricated for gears and bearings for stable opeareting under high temperature condition. All accessories and coherent parts are made by stainless steel. Application: Use for bio-mass gas transfer applications in biogas production process. Gas supply for factory or machine.